At this stage we know little about the history of the house that is now called Munday Cottage (or 50 Castle Street) in Thornbury before the Tithe Survey that was begun in 1837 and was completed in 1840. The house is believed by its owner to have been part of the neighbouring Chantry property, possibly a house for the groom. However we have not seen the deeds of the house, neither have we yet identified this property in the deeds of the Chantry. We do know that it was given tithe number 288 in the tithe map. The accompanying apportionment shows that the house belonged to the Feoffees of Thornbury and was unoccupied. Feoffees is an historical word which equates to the term “trustees” which we would use nowadays. The original charities in Thornbury were bequests which ensured that certain properties should be liable to a rent levied to provide funds for the benefit of the poor. The rents on the property were still payable after the property changed hands. At first the charities were managed through appointed feoffees but as time went on this responsibility was vested in the Corporation, in the form of the Mayor and Aldermen of the Town. Following the Municipal Corporations Act 1883, the Corporation became extinct and in 1890 their responsibilities for running almshouses and charities were vested in the Thornbury Town Trustees according to a scheme of the Charities Commissioners. We know from various rate books that the rent on this property was payable under the charities of Jones Edwards and White which were three charities which had been incorporated into one and which were set up to provide funding for the Free School in Castle Street which later became known as Thornbury Grammar School. The Free School was very probably founded by John Jones the elder, a Thornburian who was Mayor in 1573 and whose foundation had a new ‘body of trustees’ in 1606. In 1642 William White, a linen draper, had added endowments to John Jones’ foundation. He insisted that the Master of the school must be a graduate, which meant that it was to be something more than an elementary school. In fact it was frequently known as the Latin School and the pupils had acquired at any rate the basic skills of reading and writing before admission. Six years later in 1648 William Edwards of Thornbury and Alveston, a man of considerable wealth (he left his daughter Elizabeth £300 a year) gave more property to the school, built a schoolroom and left it a small library. The property now known as 50 Castle Street was part of the bequest of William Edwards who left more than one messuage within Thornbury the rent from which would help fund the school and the salary of the schoolmaster. The Account Book of the Feoffees show that the property was occupied by Matthew Mills in 1797 to 1802, then Mrs Clark from 1803 to 1816, then Susannah Trotman from 1817 to 1826, then Samuel Penduck from 1828 to 1829, John Grove from 1830 to 1837 and finally Mr Bevan in 1838. The property was void at the time of the 1840 Tithe Survey. Matthew Mills was likely to be the son of James and Martha Mills who were masons in Thornbury. Matthew married Ann Trayherne in Thornbury on 28th June 1788. They had at least two sons; Matthew on 9th July 1795 and Thomas born 22nd November 1797. Matthew Mills junior and his brother Thomas were heirs of Matthew Mills sister Sarah Hayward (nee Mills) and so Matthew Mills junior became the owner of Porch House on The Plain. Mrs Clark. We are unable to identify Mrs Clark at this stage. Susannah Trotman appears to have been a spinster. She was probably baptised in Rockhampton in 1751, the daughter of William and Elizabeth Trotman. She died aged 80 and was buried in Thornbury on 22nd April 1834. Sadly we cannot yet identify John Grove or Mrs Bevan. By the 1861 census the house was still occupied by Elizabeth Carter but it was said to be shared with Jonah Hale and his family. Jonah Hale was the son in law of Elizabeth Carter as he had married Elizabeth’s daughter, Henrietta on April 8th 1847. The witnesses to the wedding were Henry Fletcher Carter and Elizabeth Carter. Jonah Hale was the son of William Hale a labourer. In the 1851 census Jonah and Henrietta Hale were living in Earthcott in Alveston, near Thornbury. The census shows that Jonah was an agricultural labourer around 30 years old and Henrietta was around 25. By 1854 they must have moved to Thornbury because their son Joseph William Hale was baptised on 6th August 1854 and on the record of the baptism their abode was said to be Thornbury. Their second son Henry John Hale was baptised on 4th July 1858. It is interesting to note that in 1871 census Henry was said to have been born in Alveston, even though he was baptised in Thornbury. The 1861 census shows more precise ages and so we know that Jonah was now actually 36 years old and Henrietta was 32. At this point the house seems to be divided into two households. Elizabeth Carter was living with her three year old grandson William Carter (the son of Elizabeth’s unmarried daughter, Eliza). In the other household Jonah and Henrietta Hale were living with their sons William aged six and Henry aged three. A third son of Jonah and Henrietta, Frederick Hale was baptised on 6th October 1861. Their first daughter Selina was baptised on 7th January 1866. In the 1871 census the family seemed to be on their own in the house as Elizabeth Carter had moved to one of the almshouses at 9 St Mary Street. Jonah and Henrietta now had four children living with them. Henry aged 13 had become a farm worker. Their younger children, Frederick and Selina were at school. Baby Edward was only one year old. This is interesting because we have no record of Edward until he was baptised 30 July 1873. For the time being we are assuming he was baptised aged three. Another son Joseph William was living in St Aldgate with a carpenter and builder called John Allen and his wife Harriett. Joseph William (or William as he is called here) was an apprentice carpenter. Jonah Hale died on 15th June 1878 aged 62. In the census of 1881 the widowed Henrietta was a 53 year old charwoman living with her 11 year old son Edward. By 1881 her other son, Joseph William Hale, had married and moved to Horfield in Bristol with his wife Elizabeth. His brother 23 year old Henry Hale was also living with them in Horfield. Joseph William and Elizabeth later moved to Barton St Mary in Gloucester. Henrietta’s daughter Selina, aged 15, was living across the road at Stokefield House where she was a servant for Captain Henry Craven St John and his wife Catherine. Henrietta’s youngest son, Edward Hale then aged 11 was awarded a prize by the Band of Hope, the Church of England’s Temperance Movement. In the records of Thornbury Grammar School for 1881 the tenant of 50 Castle Street was listed as William Hale. In 1887 on 24th February, Henrietta’s daughter, Selina Hale aged 21 married the 30 year old coxswain John Harrison Bond (see below). By 1890 Harriett Hale was renting the property from the Governors of Thornbury Grammar School. In the 1891 census the widowed Henrietta Hale was living at number 50 with her son Edward who had become a printer and compositer. By 1901 Edward was living in Nuneaton and was described as an author and journalist. We have not yet found any of his work as an author or journalist. Henrietta Hale, Jonah’s wife, died on 16th December 1892 aged 67. According to the records of Thornbury Grammar School in 1898 Henrietta’s son Edward Hale was paying £6.00 a year rent on 50 Castle Street. John Harrison Bond. By the 1901 census what later became 50 Castle Street was occupied by John Harrison Bond aged 44 and his wife Selina aged 34. 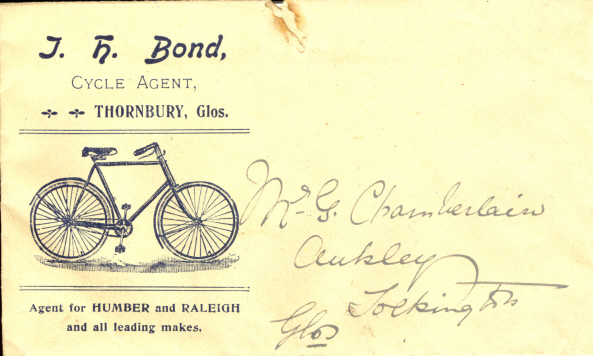 John Harrison Bond was a cycle agent. Selina was the daughter Jonah and Henrietta Hale, the previous tenants (see above). John Harrison Bond was born in Gloucester on 1st May 1856. We believe he was the son of Thomas Bond and his wife Mary. The marriage certificate of John Bond and Selina Hale says that John’s father was a livery stable keeper. The only entry we have have found in the 1871 census shows that John was a cordwainer in St Michael’s in Gloucester. In 1881 John was single and a petty officer and was a 2nd class petty officer but was not on board a ship in the census. On 24th February 1887 he married Selina Hale in Thornbury. He was described as the son of Thomas Bond a livery stables keeper and his wife Selina was the daughter of a labourer called Jonah Hale and his wife, Henrietta. In the 1891 census John was married but still in the navy and so he and Selina were not living in Thornbury. He was a first class petty officer aged 34. The list he was on in Plymouth says he was not on board a ship that night. In fact on the night of the Census he was in Stoke Damerel in Devon. The couple appeared to be lodging with Charles and Susannah Northage in Gloucester Street. By 1894 the couple had moved to Thornbury and rented what is now 50 Castle Street from the Governors of Thornbury Grammar School. The 1901 census shows that John lived in the house with his wife Selina and that he was 44 and a cycle dealer and that she was 34 years old. John came from St John’s Lane in Gloucestershire. In 1901 the February edition of the Parish Magazine shows John was the drill instructor for the Church Lads Brigade which had their drills in the Castle Tennis Court. He had been presented with a writing desk as a token of their appreciation for the time he spent with the Brigade. The 1911 census shows that they were living in what later became known as Mundy Cottage, which then had only four rooms. John and Selina had been married for 24 years and had no children. John was a cycle dealer. The advertisement shown here was in a newspaper of 1922. 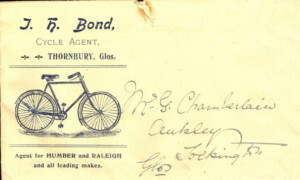 In April 1922 another article in a newspaper said that John Harrison Bond was cycling in the High Street when he was overtaken by a motor car and knocked off his bike and run over. The bike was mangled and John found himself under the car but was able to crawl out unaided. Mr Bond was obviously quite good at modern advertising techniques. As well as the large number of signs outside his door and the regular newspaper adverts, he also had special stationery printed. Below on the left we have an image of an envelope he used in 1918. By 1926 John Harrison Bond had bought the house from the Governors of the Grammar School. We have been told that John Bond was a batman for Admiral St John of Stokefield |House and that the Admiral may have helped him buy it but we have no evidence for this theory. Indeed Admiral St John died in 1909 and in 1910 John Harrison Bond was still listed as a tenant of the Governors of the Grammar School. However Admiral St John’s wife died in 1914 and there may indeed have been a legacy but we have not yet seen her will. Selina Bond died on July 20th 1927 aged 60. The report of her funeral in the Gazette said that Mrs. Bond’s death took place in the house in which she had been born 60 years earlier and where her grandmother and parents also died. The funeral was at St Mary’s Church in Thornbury. 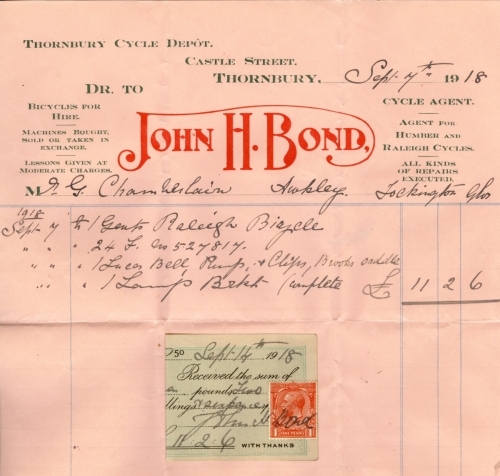 We know from the electoral registers that John Harrison Bond continued to live and trade in Castle Street in Thornbury. John Harrison Bond married Doris May Gibbins in Bristol in the September quarter of 1935. We have been told that John Bond carved the hearts in the porch of the house for Doris. The obituary of John Harrison Bond says he died at the age of 86 on October 17th 1942. The article says that he had been in the navy and retired 50 years before. According to the obituary he came to Thornbury to open a cycle shop in Castle Street which he continued to run until a few years before his death. He was a member of the British Legion and a verger of Thornbury Parish Church. His widow was Mrs D Bond. The article mentions other mourners; Mrs James Gibbins, his mother in law, Mr Albert Cist his uncle (possibly by marriage) and Gladys and Beatrice his sisters in law. In 1944 Doris Bond married for a second time. She married Charles W. Munday in Bristol, which is why the cottage became known as Munday Cottage. We have no evidence that Charles and Doris lived in Thornbury after their marriage. However, Doris Munday bought 1 Castle Street in August 1979 and she was buried in Thornbury Cemetery with her sisters when she died in February 1992. The Gibbins Family. The 1946 electoral roll shows that Beatrice Violet, Florence A and Leonard Gibbins lived in the house now known as Munday Cottage. They were Florence Annie Gibbins, the widow of James Gibbins and her grown up children. They were the mother and siblings of Doris Munday who owned the property. James Gibbins and Florence Annie (nee Cist or Gist) married in Bristol in 1900. Florence was the daughter of William Cist a carpenter and his wife Annie who lived in Bedminster. Florence and James Gibbins appear in the 1901 census as Florence and James Gibbons in Bedminster in Bristol. Their children were registered in the Bristol area. Gladys Evelyn’s birth was registered in 1904. Leonard Frederic Gibbin’s birth was registered in 1908 James in 1911 and Beatrice Violet was registered in 1913. We have not been able to trace the birth of Doris May Gibbins. However the register that was compiled in 1939 in the advent of war shows the date of birth of Doris as 13th July 1905. It is possible that Doris was registered as Dora May Gibbins in the September quarter of 1905. The 1911 census shows James Gibbins was a French polisher aged 45 living at 3 old Pack St Michael in Bristol with his wife and five of their six children; Irene Florence (aged 9), Gladys Evelyn (aged 7), Dorris (sic) May (aged 5), Leonard Frederick (aged 3) and Stanley James (aged 1). We have been told that the Gibbins family lived in Bristol during the Second World War near the bottom of Park Street. Gladys Gibbins was a cook for the BBC during the war time. We have also been told that when Beatrice Gibbins came to Thornbury she was already an accomplished pianist and that she may have had a degree in Music. Originally Beatrice worked at Oriel House issuing rations and then she moved to the Treasury Department of Thornbury Rural District Council where she worked in administration. In Thornbury Rural District Council she became known to her colleagues as ‘Cilla’ because one of the senior officers there could not remember her name and just called her Cilla for no obvious reason. The name appeared to stick. The 1950 electoral register shows that the house was occupied Beatrice Violet, Florence A, Gladys Evelyn and Leonard Gibbins. Florence Annie died on 16th October 1950 at Castle Street. Her funeral service was held in St Mary’s Church and she was buried in Arnos Vale Cemetery. Leonard Frederick Gibbins of 50 Castle Street died at the Infirmary, which was part of what had been the workhouse in Thornbury on 27th January 1956 aged 46. He was buried at Arnos Vale Cemetery in Bristol. The electoral roll of 1980 shows that after Annie Pitcher’s death Gladys returned to live with Beatrice Gibbins and Irene Thorne. Beatrice died on 20th February 1986 and was buried in Thornbury Cemetery. Her sister Doris Munday was buried with her after her death on 14th February 1992. The third sister, Gladys Gibbins also died in 1992 on 11th December.